The GSF Care Homes Training programme is the most widely used training programme for all care homes in the UK, supporting all elderly residents as they near the end of their lives. Since its launch in 2004, over 3000 care homes have completed the programme which is recognised by all major care home organisations and CQC as an indicator of quality care. Hundreds of thousands of care-home residents have benefited from more coordinated, personalised care while hospital admissions from these homes have been significantly reduced due to improved GSF Delayed Transfer of Care (DTOC). Care homes play an ever more pivotal role in the care of people approaching the end of life. One in five deaths now occurs in a care home and that number is predicted to rise as the number of deaths also increases. Just as strikingly, 80% of a home’s residents will die in the next 12 months. In response to learnings from the Vanguards, the experience of our multi-accredited homes and lessons from the 6 Steps programme, we have revised the programme, making it accessible for all providers. After over a decade of successful delivery we are now relaunching the programme as a new revised GSF Care Homes Programme from April 2018. The training has been streamlined to focus on seven key tasks and is delivered across just three and half days in recognition of the serious time pressures home staff face. It’s now also designed for homes to go on and achieve accreditation within 12 months of starting the programme and the cost has been reduced by a third to reflect the rationalised programme. It is the leading and most successful quality improvement programme in the UK, with over 2,600 care homes trained (50% of all UK Registered nursing homes). It leads to the well-recognised GSF Accreditation Quality Hallmark Award. The Accredited care homes are a hallmark of excellence in their area, recognised by CQC, by NHS Choices, by commissioners, and by other indications of quality provision. The data base of care homes is available to the general public and families often seek a GSF care home as their preferred choice for their relative. Long term sustainability of the programme has been demonstrated, in that over 600 care homes are now reaccredited 3 years on. 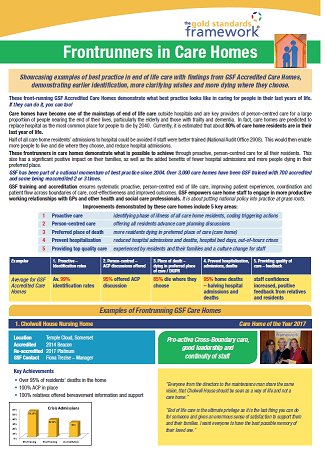 We are proud of the hard work of all GSF accredited care homes and want to celebrate the sustained excellent practice of care homes which have embedded GSF in their core working practices. In acknowledgment of this, homes that achieve re-accreditation will now be known as GSF Platinum Homes. It focuses on organisational and systems change within the home, and leads to quality assurance and recognition through a rigorous accreditation process. Click on this link to hear Andrea Sutcliffe, Chief Inspector of Adult Social Care at the CQC - Speaking about good end of life experiences. To register your interest and receive details regarding the next GSF Care Homes training programme please complete our Expression of Interest form.